The badger cull is now under way in England despite protests. About 5,000 badgers are expected to be killed in controlled shootings over six weeks in Somerset and Gloucestershire. Farmers and the Government say the cull is necessary to tackle bovine TB, but opponents say it is inhumane and ineffective. They want the emphasis to be on vaccines and tighter on-farm and cattle movement measures. The RSPCA said it was “saddened”, while anti-cull campaigners turned out in large numbers at the pilot sites to protest against what they call “inhumane” action. It is understood the cull in Gloucestershire will start later this week. 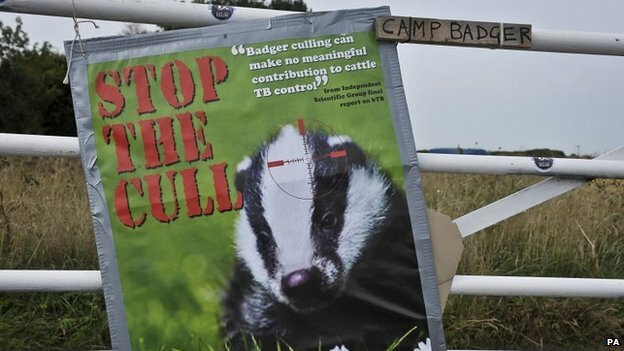 Shadow environment secretary Mary Creagh said: “The Government’s divisive badger cull will cost more than it saves and will spread bovine TB in the short-term as badgers are disturbed by shooting. This entry was posted in Badgers, Nature, Wildlife and tagged conservation, countryside, Defra, Mary Creagh, RSPCA. Bookmark the permalink. Reblogged this on Dear Kitty. Some blog. I feel, as a lifetime environmentalist, that the badger cull is more to do with gentleman farmer’s profits, as badgers dig up crops, rather than the fact they spread TB, which is why This Government are going ahead – to help their own.